MAGDALENA WELLS runs a charity mission in London’s worst slums. Although she’s heard many vicious rumors about treacherous, deceitful Michael Scott, when she meets him, she can’t help but fall under his spell. He is the most extraordinary person she’s ever encountered. If ancestry makes the man, how is she to account for his remarkable traits? His drive and accomplishments have propelled him to the highest levels of London society—which is exactly where he seems to belong. How could a ruffian be so brilliant and successful? What is his true history? Can Magdalena help to reveal the secrets he’s always been dying to discover? There was a sailor guarding the gangplank, and Etherton stoically tarried as the man glared at Anne in exasperation. 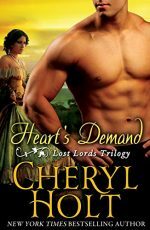 He’d already given her five minutes to say goodbye to her children and was unmoved by her plea. Etherton tried to intervene, but the sailor wouldn’t be deterred. Anne ignored him and spun to her oldest son, Bryce, who was five. He was a smart boy, a shrewd boy, and she leaned down so they were eye to eye. Anne glanced at Etherton, shame in her gaze. They’d explained that it would be permanent, that her felony conviction and banishment to the penal colonies in Australia meant she couldn’t return. But her children were very young, just five, three, and two years old. How could they be expected to grasp the concept of forever? There was no time remaining for further clarification or debate. There were only these last poignant seconds of farewell. “You must be strong for me, Bryce,” she murmured. “While I’m away, I want to always recollect how strong you are. Make your father proud.” At the mention of her beloved, deceased husband, Julian, she shuddered and nearly collapsed. As if recognizing the import of her mother’s words, the smallest child, Annie, whom they all called Sissy, slipped her hand into Bryce’s. She was blond and blue-eyed, like a porcelain doll, and her sad expression broke Etherton’s heart. How did Anne bear it? She turned to her twin sons, Michael and Matthew, and she held out her arms. Her wrists were shackled, but she reached out anyway. The twins, being rough-and-tumble scalawags, looked at each other, nodded in agreement that they wished to be hugged, then they let her draw them to her bosom. Shortly they squirmed away and stared at her, appearing concerned and very solemn. They seemed to fathom—better than Bryce or Sissy—that something very bad had happened that could never be repaired. Sissy was next. She leaned into her mother, and Anne kissed her hair and rumpled her golden curls. Then she reached for Bryce, but he refused her final embrace. Anne and Etherton exchanged a tormented glance. Their home was forfeit, their secure existence was forfeit, the life they’d known was forfeit. There was no home for them any longer, no parents or stability or family. From this moment on, there would only be chaos and uncertainty. Up on the deck, a whistle blew, and suddenly the crew was running and yelling to each other. Ropes were pulled and doors slammed. “We’re out of time,” the sailor muttered, and Anne had arrived at the end. 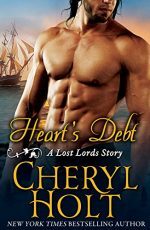 She was yanked to her feet, and though she resisted, she was dragged to the gangplank. She’d promised Etherton she would be composed and circumspect so she wouldn’t frighten the children more than they already had been. Yet she wailed with dismay, and her obvious distress terrified the children. He tried to race after her to stop the sailor who was taking her away, but Etherton held onto him, fighting to subdue the boy as he lashed out in a futile attempt to rescue his mother. In the flit of an instant she vanished onto the ship, and a dangerous silence settled on the dock as they all gaped at the spot where she’d been. They dawdled, waiting for something to transpire, perhaps for someone to speak up and clarify how a mother could be sent away and her children left behind as if they were excess baggage. But there was no rationalization that could justify it. Down the block, Etherton’s driver cleared his throat, the carriage horses shifting impatiently, rattling the harness. “Let’s go, children,” Etherton mumbled. “Might what?” Etherton barked more angrily than he’d intended. Their father, Julian, was dead in a suspicious hunting accident that Etherton didn’t believe had been an accident at all. Their mother, Anne, was being transported as a convicted felon, and Etherton was left behind to clean up the mess. He didn’t have children of his own and hadn’t wanted the responsibility thrust on him. But he’d loved their father, would have died for him, would have killed for him, and he would keep Julian’s children safe. He would keep them safe or he would perish in the trying. Nervously, he peered around. He didn’t suppose Julian’s kin would show up at the docks, didn’t suppose they cared enough about Anne’s children to harm them. However he wasn’t taking any chances, and with such fortunes at stake, there was no telling how a greedy person might behave. “Where are we to go?” Bryce asked. He was blond and blue-eyed like Anne, but he was tough and tenacious too, like Julian. He’d inherited all his parents’ best traits. “I’ll explain in the carriage,” Etherton vaguely said. He motioned to two of his servants, and they bustled over. It was a husband and wife, Mr. and Mrs. Wilson, a loyal older couple who could keep secrets. They were accompanied by their adult daughter. 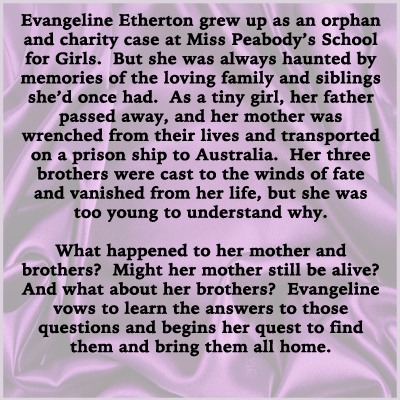 Etherton had arranged for the siblings to be separated and sent to boarding schools. It seemed a good way to hide them, and he didn’t know what else to do. Under the circumstances, they had no relatives he could trust, and he was a bachelor without the means to raise four children. As Mr. and Mrs. Wilson approached, he tamped down his spurt of conscience. He hadn’t provided any details to Anne about the children’s fate. She’d had enough to worry about, and she’d been too beaten down by events to question his plans. It was rare for such youngsters to attend school, but the right sort of bribe could open any door, and Anne had given him the last of her money—a substantial amount—and advised him to use it for expenses. The children would be reared in stable situations. They’d be fed and sheltered and educated. They’d be fine. “You’ll see them again very soon.” Etherton hoped the statement was true, but figured it probably wasn’t. It had all happened so fast—Julian’s death, Anne’s arrest and trial—almost as if Julian’s father had orchestrated the swift resolution. Matters were still unsettled, and Etherton couldn’t guess when they would calm, when he could stop peeking over his shoulder. The entire morning had been too awful, and he gestured to the Wilsons to hurry away, desperate for the horrid interval to be over. He had no idea how to deal with such misery, with shrieking, fretful children who were too young to comprehend what had destroyed them. Would they ever comprehend it? Mrs. Wilson’s daughter picked up Sissy, and she started to scream and weep. She reached out to Bryce, her plump hands beseeching. Bryce clasped hold and shouted for the woman to put Sissy down, but Sissy was yanked away. Mr. Wilson seized the twins, but they kicked and struggled, so he looped an arm around each one, hoisted them off the ground, and marched away. The last Etherton ever saw of the twins, they were peering back, stubbornly and silently staring at their brother and sister. Their blue eyes—their father’s magnificent blue eyes—shifted to Etherton. They were disdainful and condemning, as if they blamed Etherton for what had transpired. How could two such small boys be so resolute and contemptuous? They rarely spoke except to each other, and they talked in a secret language only they understood. Perhaps they were brighter than they seemed. Perhaps they grasped much more about the debacle than Etherton had realized. They were little lords too, just like Bryce, but they were all lost lords now. Their sneering, scornful gazes dug into Etherton as if to say, We’ll get even for this. We’ll get even—and everyone will pay for what they’ve done to our family.